← Viognier, Black Hills Estate Winery, Okanagan, Oliver, Okanagan Valley, BC, 2013, 13.3% abv. This BC wine was the winner in the Judgement of BC blind tasting held in August 2015 in Vancouver. Now, this was no small feat – 12 BC wines (Chardonnay and Syrah) were cast against 12 benchmark Chardonnay and Syrah wines from regions located around the world. 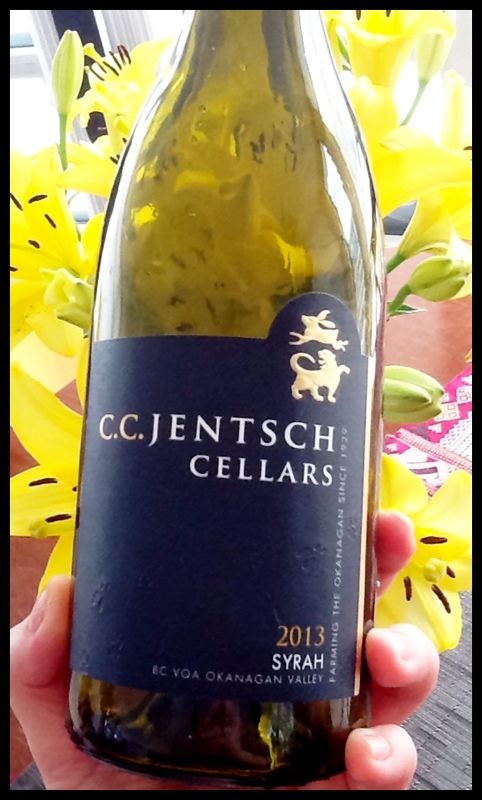 While BC wines didn’t fare so well on the Chardonnay side of things, the CC Jentsch Cellars 2013 Syrah placed first. The rather famous Steven Spurrier who organized the even more famous Judgement of Paris in 1976 was in town to sit on the panel for this event, having attended the BC Pinot Noir Celebration the weekend before (where yours truly was a judge). The CC Jentsch Syrah verges on deep ruby and on the nose, a tingling minerality accompanies deep, ripe purple fruit with plum, vanilla, ginger and clove, and significant pine and cedar. There’s an underlying base of tar adding to the complexity. The palate is dry with some gorgeous tannins that offer just enough strained grip to go with your meat or charcuterie. Alcohol and acidity are perfectly positioned and flavours include sausage and pepperoni, tobacco and more Damson plum with ripe field berries and sweet cranberry, vanillin and ginger blossom. A distinct herbal pine cone and soya sauce accompanies the long, lingering finish on this balanced, layered, expressive Syrah. This entry was posted in British Columbia, RED, Shiraz / Syrah and tagged 13.8% abv., 2013, BC, CC Jentsch Cellars, Judgement of BC, okanagan valley vqa, Oliver, red wine, Steven Spurrier, syrah. Bookmark the permalink.